This map is taken from the excellent and intriguing cominganarchy.com . Fairly obviously, it shows how available alcohol is in the G.C.C. states. 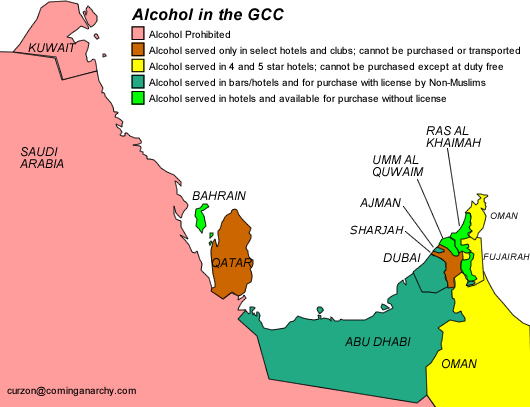 I’ve noted already that Qatar is wrong: you can buy alcohol in Doha with a license. Also, it may be worth nothing that alcohol in Kuwait and K.S.A. is freely available if expensive on the black market. This post also offers me the opportunity to flag up the best April Fool’s joke ever in the Kuwait Times some years ago (the link at the bottom). In one unnamed GCC state that allows offsale to non Muslims without a license, a group of enterprising chaps from the Subcontinent had a highly useful service for visitors (and perhaps even locals) from Muslim countries. Pull into the parking lot nearby, place your order, and one of the lads will nip into the shop and return with your desired beverage. Or the hotel in one unnamed Kingdom that had a special villa on the coast, where expats (only) could enjoy a limited range of beverages — including to my surprise bottles of beer.